Key Features 1. Chef waist apron w ties – choose your preferred style. 2. Beautiful carp embroidered sushi apron for high end oriental restaurants. carpembroidered chef apron Pocket om the front. 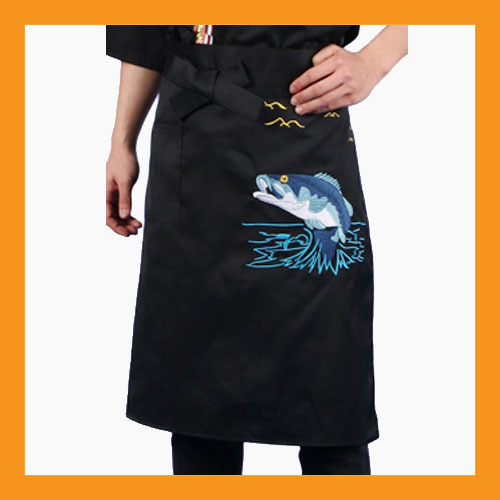 convenient front pocket of sushi chef aprons 3. Size – 75 x 63(H) cm (about 29.5 x 24.8”) ties Material – T/C Color – Black For more great items, check our store! We have various types of Sushi Coats, Anti Slip Tape, and many more hard to find restaurant supplies. Payment We accept Paypal, Moneybookers, Western Union, Wire Transfer. Shipping 1. Buyers outside US MUST contact us first for postage and availability. 2. We'll ship this item within 34 business days after receiving payment. 3. You can choose one of the following shipping methods: 1) Registered Air Mail - Usually takes 1020 BUSINESS days after we ship. 2) Expedited Air Mail(EMS) - Usually takes 58 BUSINESS days after we ship. 4. Actual shipping time entirely depends on your country's Customs and postal service. They can hold the item and delay its delivery for SEVERAL months. 5. Buyers are responsible for Customs charges or any taxes. We do not mark an item as a 'Gift' or undervalue its price. Tracking 1. After shipment we email you RR number(Registered Air Mail) or EM number(EMS) for the tracking. 1) Registered Air Mail - Online tracking is NOT available. MUST allow 10 BUSINESS days after it's shipped and CALL your Post Office. 2) Expedited Air Mail(EMS) - Online tracking is available at USPS site. 2. Your item is coming from across the Pacific Ocean. Please allow the above minimum shipping time before you contact us.